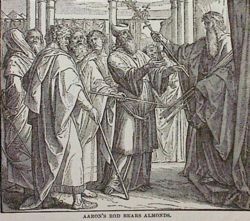 Aaron's Rod (Hebrew: מטה אהרן) refers to the staff which, in the hands of Aaron, the high priest, was endowed with miraculous power during the plagues that preceded the Exodus. In this function the staff of Moses was equally potent. Upon two occasions, however, the singular virtue of spontaneous power, when not in the grasp of its possessor, was exhibited by Aaron's Rod. At one time it swallowed the rods of the Egyptian magicians, and at another it blossomed and bore almonds in the Tabernacle, as an evidence of the exclusive right to the priesthood of the tribe of Levi. In commemoration of this decision it was commanded that the rod be put again "before the testimony" (Numbers 17:10). Hebrews 9:4 tells that the rod was later kept in the Ark of the Covenant, confirming that the rod was preserved in the Tabernacle as a relic of the institution of the Aaronic priesthood. The Bible ascribes similar miraculous powers to the Rod of Aaron and to the staff of Moses, while the Haggadah identifies them as one and the same. The Midrash Yelamdenu states that: "the staff with which Jacob crossed the Jordan is identical with that which Judah gave to his daughter-in-law, Tamar (Genesis 32:10; 38:18). It is likewise the holy rod with which Moses worked (Exodus 4:20-21), with which Aaron performed wonders before Pharaoh (Exodus 7:10), and with which, finally, David slew the giant Goliath (1 Samuel 17:40). David left it to his descendants, and the Davidic kings used it as a scepter until the destruction of the Temple, when it miraculously disappeared. When the Messiah comes it will be given to him for a scepter in token of his authority over the heathen." This page was last modified on 12 July 2016, at 19:48.